More than just great fishing! Contact Noel Gyger to book your next guided fishing adventure! 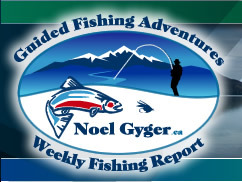 Follow Noel Gyger Fishing Report updates on twitter! 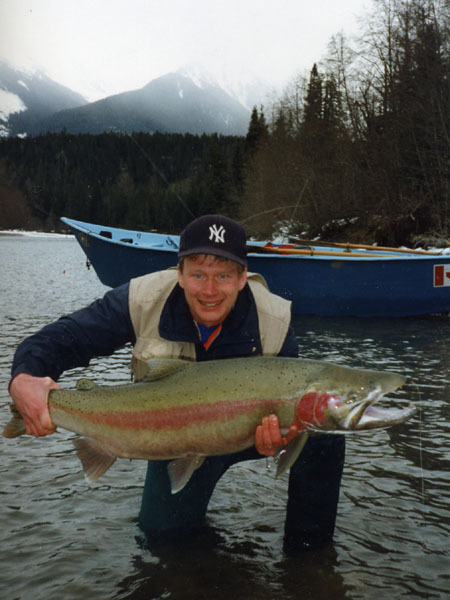 Welcome to the most “up-to-date” LIVE Regional Fishing Report for Terrace, Kitimat, Smithers, and Prince Rupert BC Canada for World Record Salmon, Steelhead, Trout and Char fishing. Sign up here to receive the FREE Fishing Report notification via e-mail. Don't miss out on any of the ACTION! Would you like a similar experience? Then book with Tracey John Hittel of Kitimat Lodge, Got questions for Tracey? E-mail: tjhittel@telus.net or call his cell phone: 250-639-4277. He would love to hear from you. - 2019 Kitimat River drift boat for spring Steelhead BOOK NOW ! - 2019 Multi Rivers for spring Steelhead BOOK NOW ! - 2019 Douglas Channel ocean fishing for Salmon and Bottom fish BOOK NOW ! Cast on any link above to e-mail Noel Gyger to receive all the details for a trip of a lifetime! Noel will put you in "direct" contact with the fishing guide to work out all the fine details. Cast here for INFO and to BOOK a Terrace, Kitimat, Smithers, Prince Rupert or Meziadin North pro fishing guide. Click the link to review the Past Fishing Reports. Book with me for the “best” Skeena River, Terrace BC Guided Fishing Trips, for Conventional (Spin or Drift) Fishing or Fly Fishing (single hand fly rod or double hand Spey fly rod), River or Ocean! Click on the link to read a "few" testimonials from very happy guided guests! Click on the link to view ALL of the Photos of the Week with captions! Click on the link to learn more about my credentials and history. I will book you with “quality” guides I know and trust “extremely” well. You deserve to book with the best. Click on the link to read information articles published about my guiding service. For information and to Book a northwest fishing guide/lodge please contact me anytime. Name your preferred fishing, time of year and I will book you with a professional British Columbia fishing guide. You may be guided by jet boat, drift boat, raft, vehicle, quad, hiking (walk and wade) or helicopter and stay at the BEST British Columbia fishing lodges and/or QUALITY outpost camps. Many repeat guests’ book up to three trips in one year with the same guide but for different fish on different rivers. Spring for Steelhead, Summer for Chinook, Sockeye, Pink and Chum and Fall for Steelhead and Coho. My guided area covers most rivers of Northern British Columbia, Canada including Kalum River, Skeena River and tributaries, Nass River and tributaries and other coastal rivers including the Kitimat River and Salt Water charters out of the ports of Kitimat and Prince Rupert. In addition to booking guided fishing trip to the Terrace and Kitimat BC area I also book exclusive helicopter fishing and helicopter adventure along the whole west coast of British Columbia. These trips include heli fishing, helicopter sport fishing, helicopter fly fishing, helicopter spey fishing and helicopter family adventure, luxury fishing vacations, luxury family vacations, wilderness vacations, corporate retreat all based out of a luxury adventure, wilderness resort. Investigate the great bear rain forest. Lunch is served on top of the world on our beautiful glaciers. Skeena River (all four sections 1-2-3-4), Kalum River (upper and lower sections), Zymoetz (Copper) River, Exstew River, Zymacord (Zymagotitz) River, Kasiks River, Exchamsiks River, Ecstall River, Kitimat River, Giltoyees Creek, Kemano River, Kildala River, Kitlope River, Nass River, Cranberry River, Kiteen River, Ishkheenickh River, Kincolith River, Meziadin River, Bell-Irving River and Kwinamass River. I will book other rivers by request such as Babine River, Kispiox River, Bulkley River and Morice River or any other river in BC. I book both classified rivers and non-classified rivers. Prince Rupert ocean fishing and Kitimat (Douglas Channel) ocean charters for Halibut, Bottom Fish, Dungeness and Alaskan King Crab. Click on the link the view ALL of the Photos of the Week with captions. I book the following classified waters: Wakeman River, Nekite River, Kingcome River, Kakweiken River, Ahnuahti River, Seymour River as well as over 40 unclassified rivers and lakes throughout northern Vancouver Island and the central coast from Knight Inlet to Bella Coola. Click on the link to view Scenic Photos of beautiful rivers in my area! I also book for world class Grizzly Bear viewing (ie: Khutzeymateen Grizzly Bear Sanctuary), Animal and Bird viewing, Whale watching, Jet Boat tours, Provincial (BC) Park tours, Kayaking, Helicopter Hiking tours and Seaplane sightseeing tours. Average size Chinook: Skeena River 40 pounds, Kitimat River 30 pounds and Kalum river 30 pounds. World record Chinook Salmon caught in the Skeena River weighed 92.2 pounds, Kalum River 85 pounds and Kitimat River 74 pounds. 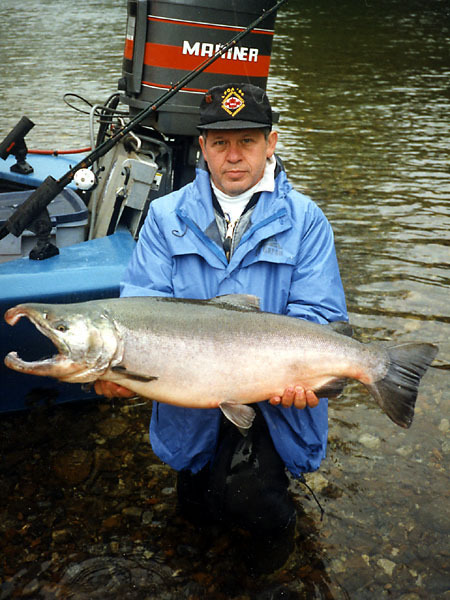 Coho Salmon average 10 - 12 pounds, but in the fall you can hook them in the 20-25-pound range. We call these fish "northerns" with the "BIG" northern "hook" nose. 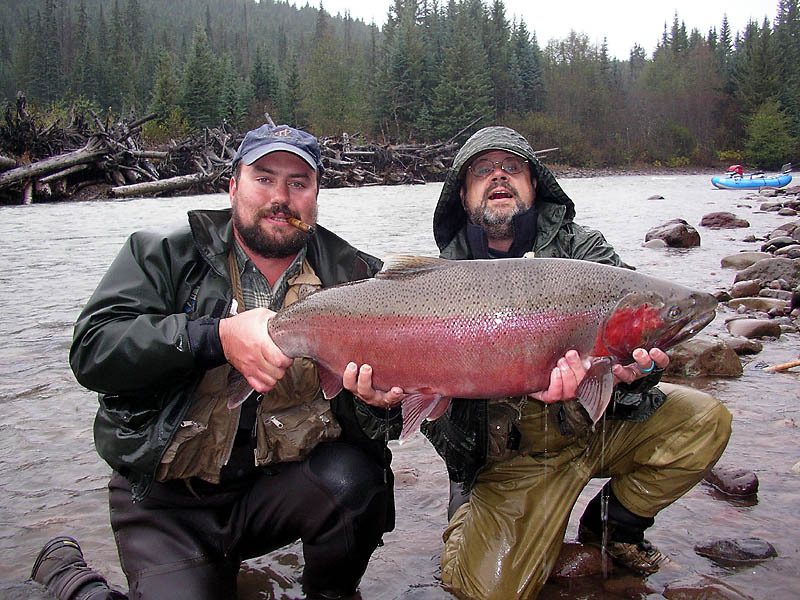 Steelhead average 12-14 pounds with some weighing more than 20-25-pounds. Fabulous River Fishing Year Round!! Cast here to view (approximate) one minute Video Clips of Salmon and Steelhead fishing. Click on the link to watch my fishing Podcasts about Fishing with the BEST - best river guides, best ocean guides, best lodges, best boats, best helicopters, best tackle, best interviews, best fishing "hot spots" and best moments in history, etc. My GOAL is to do "everything" possible for the Conservation of wild Salmon and Steelhead. North Coast: Guiding starts on the Kalum River April 1 for "wild" Steelhead on a private (take-out is on private property) five mile drift that has 27 pools, most of which are excellent for the fly and spin rods. Drift-boats or rafts are used on the upper five miles and guiding the lower five miles is with jet-boats. Jet boats are also used on the upper end if there is enough water. There is no hatchery Steelhead in the whole Skeena system. These wild fish have been holding there all winter. This river also has a winter and spring run of Steelhead. Central Coast: Over 30 years experience and extensive environmental records give us an advantage over 50,000 sq miles of fishing territory, accessible only by helicopter. We start fishing Steelhead in the middle of March through April and May. All of our trips are out of our private lodge where you return every evening to gourmet cuisine, massage, hot tubs and world class service. North Coast: Same as above but add the Kitimat River and Skeena River PLUS remote coastal streams such as the Kwinamass River. Also, Chinook salmon start coming into the Kalum River in early April making it possible to catch both Steelhead and Chinook on the same day. This is an exhilarating experience! Central Coast: This is a "great time" for winter Steelhead Rainbow Trout and Dolly Varden Char in many of our coastal rivers. Our professional guides and seasoned pilots bring you to remote classified and unclassified rivers of British Columbia’s central coast. 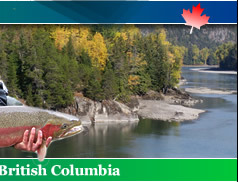 North Coast: The Chinook (King) salmon are throughout the Skeena River and Kalum River. Depending on the size of the run and river conditions, angling for these "monsters" can be fantastic! Steelhead is still plentiful. Both Chinook and Steelhead can be caught on the same day with "expert" guidance of Terrace or Kitimat BC river fishing guides and ocean charter guides. Central Coast: This time of year we are focusing on Steelhead and trout with our private helicopter trips. Giving you access to many rivers over the length of your stay. April has a similar fishery to May. North Coast: The spring snow "run-off" is at its maximum making it difficult to angle due to the possible poor water conditions, usually high and dirty. However, the Kitimat River, not being part of the Skeena drainage system, can be fishable for Chinook (King) with some excellent results. Even a few late “spring run” Steelhead may be taken. Usually, by the middle of June, we can fish the Kitimat River with a very good success rate. Kincolith River Chinook fishing can be fabulous; the fish come in with the tides. Other isolated coastal wilderness rivers can produce the same result. Our fishing guides know where to take you. OCEAN FISHING IS PRIME IN JUNE! Don’t forget the Dungeness Crab and Prawns! Central Coast: This month is best for Dolly Varden Char, Rainbow & Cutthroat trout. We are waiting for the salmon to reach the rivers. North Coast: This is “prime time” for “giant” guided Chinook Salmon on the Skeena River, Kalum River and Kitimat River. Be ready for a “good scrap!” Chum salmon in the Kitimat River and Sockeye and Pinks on the Skeena River. Also, it is quite possible to hook a “screaming hot” Steelhead on the Skeena River while fly fishing for Sockeye or Pinks. Central Coast: Rainbow & Cutthroat trout are still abundant. On the 20th of July we focus on Coho, Pink, and Chum. There are over 40 river and lakes to choose from on any given day. Summer run Steelhead start around the 15th. North Coast: Chinook (King) salmon fishing continues, but mainly catch and release. Fresh Coho (Silver), Sockeye and Pink salmon are throughout the Skeena River and fresh Coho and Chum are entering the Kitimat River. 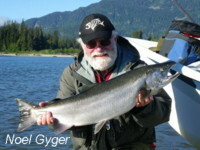 Gleaming silver "summer-run" Steelhead are in the Skeena River. These fish are fresh and full of energy and it is common to hook Steelhead that weigh in the 20 - 30 pound range. This is “prime time” for fishing Chinook on the Ecstall River. This river is truly a remote “5 star” river. This is the ultimate guided fishing experience and it books up very quickly. Fresh summer-run Steelhead is starting to enter the Copper River, try and catch one of these on a skating dry fly. It is a life altering experience!! Silver fresh Coho are starting to enter their home river at the end of the month. Central Coast: A fantastic month for all our rivers and for all species of Pacific salmon. Fresh bright Coho10 -18 pounds, Pink salmon are a blast on light fly gear. Along with great fishing the weather is superb. Making available a host of other activities. 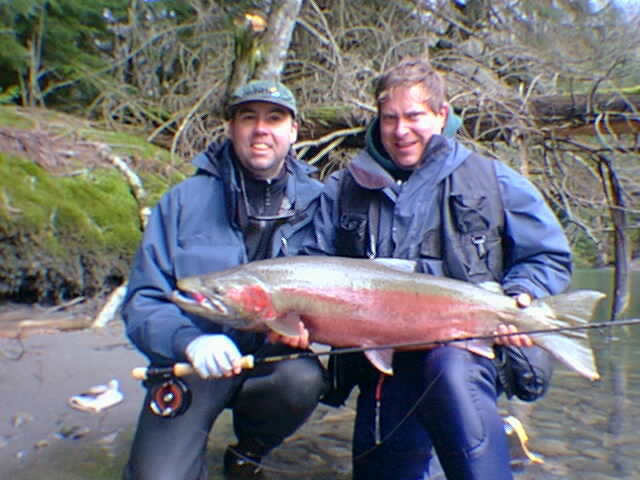 North Coast: "Summer-run", Steelhead fishing is very strong. The main runs of "northern" Coho (Silver) salmon are now entering the rivers and can give you quite a "tackle straining" experience. Nothing but fresh fish is the norm for this month. The Coho (Silver) salmon can weigh up to 25 pounds, but average 12 pounds. This month is also very special because guided fly fishing begins for both Steelhead and Coho. Trout and Dolly Varden are also plentiful at this time. Ask about “fabulous” Steelhead fishing in remote camps on the Nass River and Bell Irving River. Central Coast: The great fishing continues in all of our systems for trout, Coho and Chum. This is the best time to hook into large Chinook salmon. There are summer Steelhead at this time. Although we do not focus on them this is a great time to fish for them. 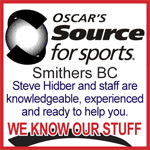 North Coast: This is "prime time" for the Steelhead in Copper River and "blow-out" Coho (Silver) Salmon fishing on the Skeena River tributaries such as the Kasiks River and Exchamsiks River. Steelhead is also available in the Cranberry River, Meziadin River and Bell Irving River. 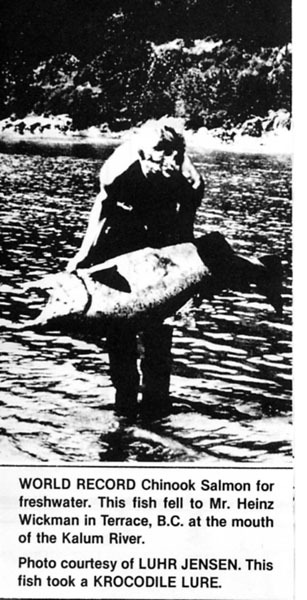 The record Coho (27-pounds) was landed at this time on the Kasiks River “the most beautiful river in the world”. 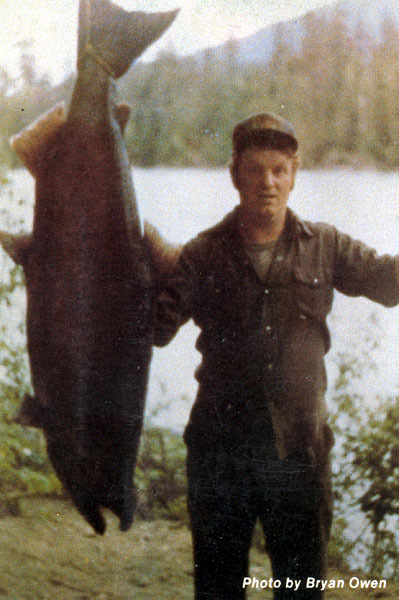 Outstanding guided Coho fishing can also be had on the Kitimat River and Ishkheenickh River. Central Coast: Coho fill the rivers. 24 pounds on the top end and averaging 15 pounds. These fish are full of life and never disappoint. Chinook, Sockeye and Chum continue to delight anglers. Dolly Varden Char, Cutthroat & Rainbow trout are still abundant. North Coast: Guided fishing is available on the Kalum River until October 31. If the Zymoetz (Copper) River is clear it is "prime time" for Steelhead on the (dry or wet) fly. Coho (Silver) salmon are still available for the first week in November on the Skeena tributaries but most fish are dark. 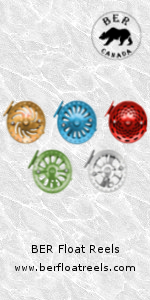 These would be “incidental” catches as they cannot be the target fish. Coho fishing usually closes on October 31. Central Coast: our season finishes on the 31st of October. "To Fly is Human...to Hover Divine." Come and enjoy the BEST guided spin and fly fishing for Salmon and Steelhead on the Skeena, Copper, Kitimat and Kalum Rivers, plus many others. 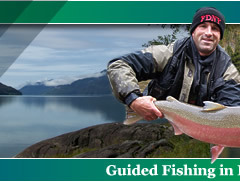 Experience for yourself the JOY of fishing with a top British Columbia fishing guide. These Canadian Skeena River fishing guides and fishing charters usually guide both Freshwater and Saltwater and are based in Terrace British Columbia Canada. Cast here if you would like to exchange "Links"